Have you ever touched wood? Could you stab a photograph of someone you love? As skeptics, we are aware that our normal, adaptive psychological processes throw up anomalistic perceptions from time to time. In fact, they contribute to stable and recurring themes in religion and superstition. This exhibition beautifully illustrates how these ideas have infiltrated our consciousness and behaviour through the last several hundred years. People have always protected themselves, their loved ones, their livestock and their homes by using magic. We can see ‘witch bottles’ – containers containing substances like urine or toenails which are these are intended to divert the potent force of maleficent spells before they reach their human targets within the building. As exhibition curator Dr Owen Davies said about these items, buried under thresholds or embedded in walls: “Many homes are undiscovered museums”. But many did not stop at protection: they used magic to perpetrate. 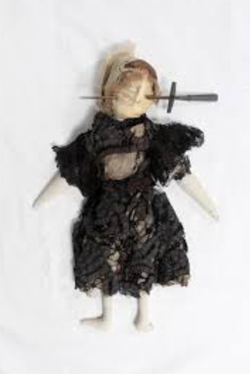 The exhibition has a garland of feathers, a dagger-stuck poppet and a toad stuck with many thorns – all intended to cause harm by magic to others. Of course, magic was often also a middle- or upper-class practice. Doctors were at one point required calculate the position of the moon before they performed operations. One of my favourite Dr John Dee related-objects has been borrowed for this exhibition: his purple crystal, which he claimed to have been given him by the angel Uriel. Also associated with Dee (though far less reliably) is an Aztec obsidian mirror which could be used for scrying. Magic was used by a few educated people in an attempt to quantify and control imperceptible and mysterious powers, and that’s a reminder that high-magic is inextricably linked with the emergence of science and the scientific method from the fifteenth century onwards. There is a wonderful room of artwork too. As curator Malcolm Gaskill reminded us you skim over these fascinating pieces to your own loss, contemporary people live in a very visually saturated environment and it is easy for us to miss the many visual dramas and themes depicted. The exhibition comes right up to the date with the phenomenon of lovelocks. The ritual of affixing locks – symbols of permanence – to border or transitional places, like bridges, has been spontaneous and become popular over the last couple of decades. Without top-down direction or herding of any kind, it seems that people have developed a way of marking their feelings using the same old metaphors and symbols that have served humans for millenia. You can enter Spellbound, either by going under a ladder or else by avoiding it. The museum is looking and counting its vistors’ preferences, and will publish in the fullness of time what proportion of us tempted fate. Disclosure: I walked right under the ladder. Of course I did … I’m a skeptic! Whether you are a believer or a student of human nature, this exhibition is for you. It shows that, however rational we believe ourselves to be, we are all Spellbound.